“[Y]ou’ve got two prime examples of people being indifferent to the need to protect their paintings”. So says Charles Hill in an interview with BBC Radio 4 on the theft of this work from the Khalil Museum in Cairo on Saturday, which bears similarities to the theft in Paris earlier this summer. The thieves cut the work from the frame. Though some early reports indicated that the work had been recovered, that now appears to be inaccurate. Two Italians have been detained at the airport, they were among the ten people who apparently visited the museum on Saturday. It seems only 7 out of 43 security cameras were functioning. The same work was stolen in 1978, and was apparently recovered in Kuwait soon after. Galleries warned after art thefts, BBC, August 23, 2010, http://www.bbc.co.uk/news/entertainment-arts-11058596 (last visited Aug 23, 2010). 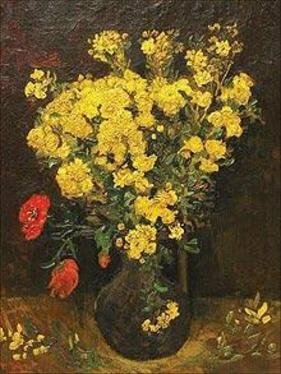 Stolen Van Gogh painting still missing, the Guardian (2010), http://www.guardian.co.uk/artanddesign/2010/aug/22/stolen-van-gogh-still-missing (last visited Aug 23, 2010). Alaa Shahine, Van Gogh $55 Million `Poppy Flowers’ Theft in Cairo Blamed on Lax Security, Bloomberg, , http://www.bloomberg.com/news/2010-08-22/van-gogh-55-million-poppy-flowers-theft-in-cairo-blamed-on-lax-security.html (last visited Aug 23, 2010).